The sublime Oris Big Crown Date combines the best of Oris refinement, with a sharp, technical edge. The stealth grey colouring of the watch provides a bold background for the distinctive 3D Superluminova numerals and indices. The watch features a stainless steel case, with a grey PVD coating for an attractive urban finish. The fluted Big Crown bezel with screwed case back is a stylish addition to this strong and distinctive model. The focus of this timepiece is its unique dial. The 3D indices and numerals are made of a solid block of dark Superluminova, which stands out beautifully against the grey backdrop of the watch. Fans of aviation will undoubtedly connect the strong aesthetics of this capable timepiece with the grey in grey design of stealth planes. 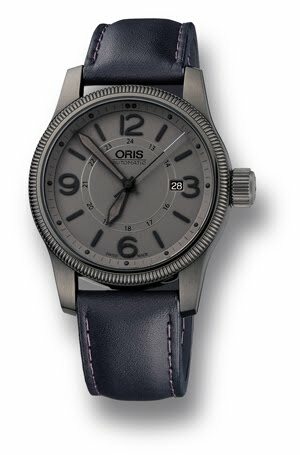 In typical Oris style the watch features double doomed sapphire crystal with a non reflective coating on the inside. The dark brown leather strap with pin buckle is a simple, yet a beautifully complements the “stealthy” appearance of the watch. • Automatic movement Oris Cal. 733 based on SW 200. • Stainless steel case, grey PVD coated. • Fluted Big Crown bezel and screwed case back. • Dark grey dial with applied grey 3D-Superluminova numerals and indices. • Double doomed sapphire crystal with non reflective coating on the inside. • Date at 3 o’clock. • Dark brown leather strap with pin buckle.